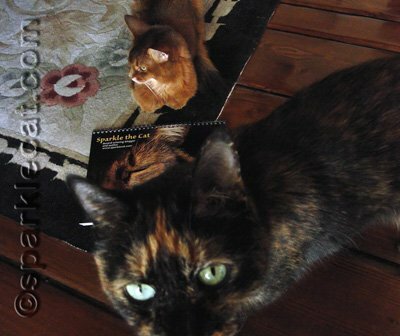 You are here: Home / Shop / Cat Stuff for Humans / Cat Calendars / Ignore the Tortie in the Way – Get My 2012 Calendar Here! 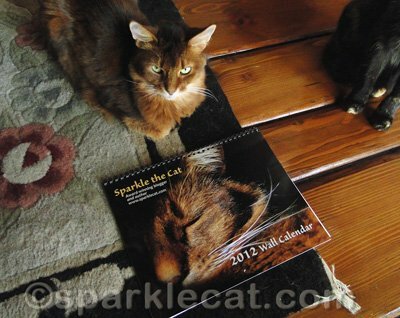 Ignore the Tortie in the Way – Get My 2012 Calendar Here! My human has been slacking off all week (never mind her claims that she is “busy” — I know better! ), so I’m just now getting around to selling the extra copies of my calendar. These are left over from the two cat shows my human worked. I have just 11 of them and I need to sell them by the end of the year! What I don’t need is to have my attempt to sell my calendars photobombed by Binga! 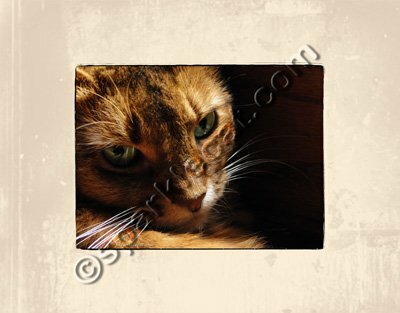 It’s the same price here —$20.95 — as the full price listed on my Zazzle store, but the difference is that my human is taking a dollar from each calendar sale and adding it to the donation she is already making to one of our favorite cat rescues and sanctuaries, Tabby’s Place! Shipping is $5 in the U.S. or $13.25 internationally, whether you are buying 1, 2 or 3 calendars (they make great gifts!). Sales tax will be charged to California residents. If you order it by noon Pacific Time on Monday, December 19, it should get to you U.S. residents before Christmas! But don’t wait until the last minute — get yours now! My gosh…I can’t ignore that Tortie in the way. But you are BOTH completely gorjuss! What a great calendar! Good luck! That is a lovely calendar Sparkle. Binga wants her own calendar! Those calendars are absolutely beautiful, but I can’t allow the credo into my home. Our cats already think they rule the place (and don’t understand that they are placed here for my amusement). Binga, we think you should have your own calendar too! Sparkle, your eyes are so stunning in that last photo! Maybe you could help Binga get her own calendar. Then she’ll leave yours alone. That last photo is a winnah! Hmm, seems to me that Binga is a little jealous of all the attention. 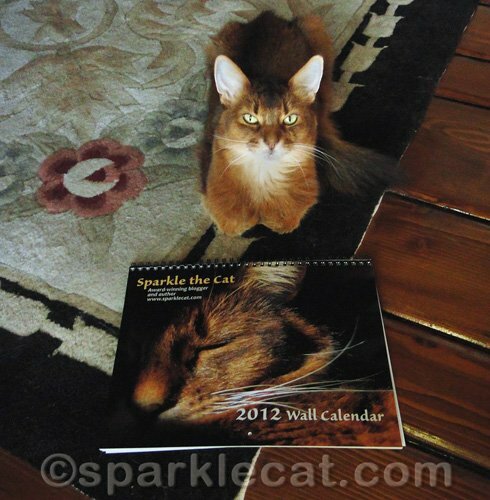 Great calendar, Sparkle! But shouldn’t Binga have a calendar, too? Just asking. That sure looks like a terrific calendar. Binga, do you come with the calendar?? You are too funny. Take care. 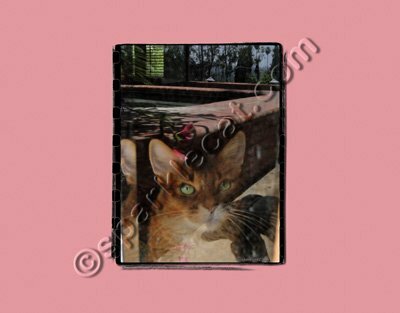 gret calendar….maybe you could offer Binga as a bonus gift?? Is Binga trying to get the lime light Sparkle? 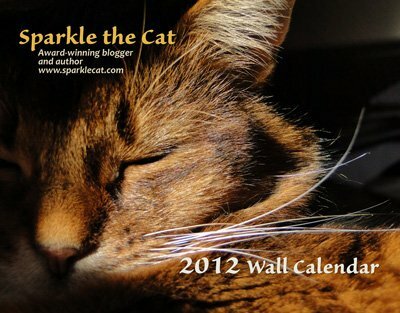 Sparkle, we thing Binga wants her own calendar too! !